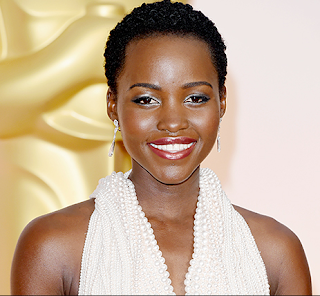 Apart from her Oscar winning acting and all the red carpet stuff, Lupita is also known for her sense of style and incredible looks. The 32 year old seems to be knowing her stuff very well, that the paparazzi can't stop following her around just to get a glimpse of what the celeb is wearing. During last week's appearance at the ABC studio for an interview, she decided to wear a form-fittin, sleeveless grey dress with a slight figure-hugging catch to it that showed the star's gorgeous figure. On top, she covered the dress with a matching, chic great blazer with the collar flipped up and everybody wanted a selfie with her.